Production for the final episode of Dexter, has already begun, and this week was pretty difficult for some cast members of the show. Goodbyes, teasers and a bunch of cool tweets are waiting you after the jump. Beware of possible spoilers! Day 1 of ep. 812. I want to take pictures and tell you about stunts that turned into bloopers but it will have to wait bcuz u R not ready!! I don't mean 2 tease (wink). I just want 2 talk about things i can't talk about, that's all. Lemme c if I can steal a pic 4 u soon (smile). Tonight @dezharrington gave 1 of the best performances I have ever seen on Dexter. Or anywhere for that matter! uhavealottolookforwardto!!! 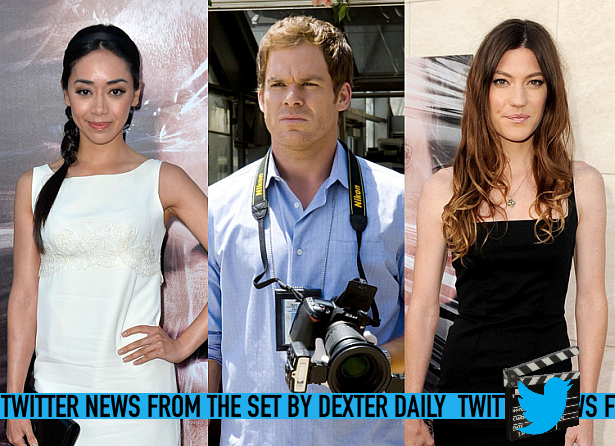 Aimee Garcia and Jadon Wells on the set of Dexter on Monday 6/24. Jadon Wells aka the new Harrison Morgan, has his own Twitter account and shared few thing from the set! Aimee Garcia last day on the set was on Friday! Goodbye Aimee! First day of the last episode of #DEXTER. Oh people, it's going to be KILLER.